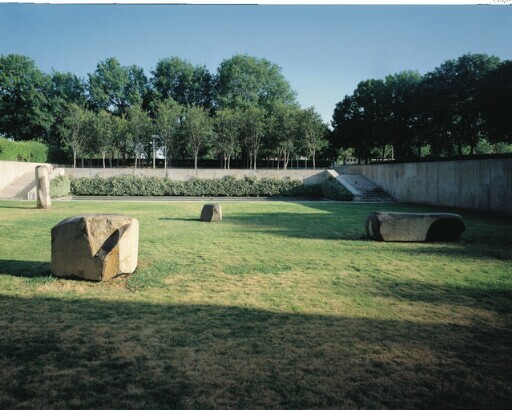 Around 1980, the great twentieth-century stage designer, furniture maker, and sculptor, Isamu Noguchi, was inspired to create a sculpture ensemble for the grass courtyard on the south side of the Kimbell in honor of architect Louis Kahn. Noguchi himself arranged the sculptural elements on the site on August 1, 1983. Noguchi and Kahn had worked together in the early 1960s on a never-realized playground for Manhattan’s Riverside Park. Although Kahn only began to develop designs for the Kimbell in early 1967, Noguchi had already created an outdoor sculpture plaza in downtown Fort Worth in 1961, at the corner of Lamar and 7th Street. Indeed, excepting the garden of granite boulders, only partly carved or painted, made by Max Ernst for the Maloja, Switzerland, home of Alberto Giacometti in 1934, Noguchi deserves the credit for developing the influential type of post-World War II sculpture in the spirit of Japanese garden design, that is with carefully chosen rocks placed to create a setting of intuitive harmony. His first such project was the garden for the UNESCO headquarters in Paris, France, finished in 1958. Given his longstanding interest in lunar themes, it was perhaps the basalt-like moon rocks brought back to earth in 1969 that inspired Noguchi in the 1970s to use basalt monoliths as a primary material. This igneous rock, rich in iron and black augite, weathers brown; by leaving the rocks untouched on some sides while chiseling and polishing them on others, Noguchi found a palette of different colors within these boulders. His sculptor’s exploration of these varied inner visual properties perhaps led him to entitle one of his basalt monoliths Rock of Inner Seeking, 1976 (National Gallery of Art, Washington). Although Constellation fills one of the empty spaces so characteristic of Kahn’s designs for the Kimbell, it nevertheless makes a most successful addition to the spirit of the great building by referencing one of Kahn’s favorite topics, the prehistory of architecture, evident in the mysterious menhirs of the earliest structures made by humankind. acquired by Kimbell Art Foundation, Fort Worth, 1983; Gift of the Isamu Noguchi Foundation in honor of Louis I. Kahn and the Kimbell Art Museum. With thanks and goodbye to Shaindy Fenton.